I have the Letter K for you today. Tangled with Kay-Tee and Footlights. When you attempt this challenge we are always supposed to use at least one tangle that starts with the letter we are using. 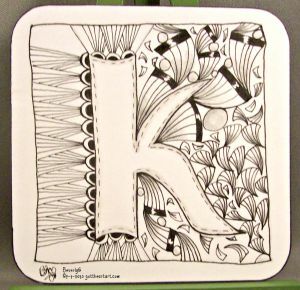 Would love to see what you would use with a Letter K that you tangle. Beverly, I love your tile. Great job! Love the stitching around the edges of your K. A great tile.